Recreational Water Illnesses (RWI's) are now officially recognized as a significant public health issue in the United States. Chlorine is a fairly good disinfectant which eliminates a large number of bacteria and some viruses. It’s also a fairly strong oxidizing agent, reacting with organic matter in the swimming pool water. Unfortunately, chloramines formed by chlorine are responsible for RWI's such as eye, skin and nose irritation and breathing difficulties. Chemicals have a negative effect on the materials the pool is built with. Also, there are some dangerous pathogens (viruses and cysts) that chlorine does not affect. The application of ultraviolet light to disinfect water has become an accepted practice since the mid-20th century. Pool owners are now getting more and more aware of the risks of chemicals in pools. For their own health, but also for the environment. Ultraviolet purification opens many doors for the pool industry to enable happier and healthier swimming. 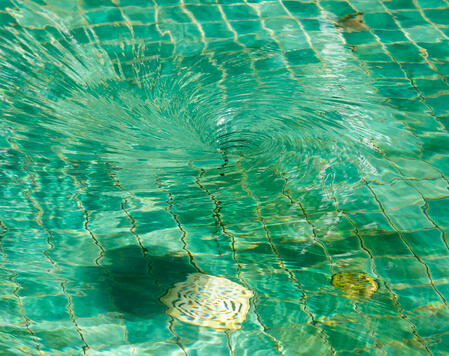 UV water treatment deactivates all bacteria, viruses and molds in swimming pools. UV-C is known to be able to break down chloramines. The chlorine concentration can be decreased up to 80% when using UV-C and up to 99% of the microorganisms will be eliminated. Swimmers have a much better experience and filters are backwashed less frequently, with less water use as a result. “Destroying waterborne germs that can make swimmers sick is the goal of swimming pool sanitation. Sanitation can be carried out by subjecting pool water to ultra-violet (UV) light.” - Fred Reiff, P.E., retired offcial from both the U.S. Public Health Service and the Pan American Health Organization. If UV-C is so great, why not stop using chlorine for pool sanitation altogether?